I just checked and Snowball Ninja finally made it into the top 50 free shooter apps in the USA and Great Britain. This is good news as being a pubcenter ad supported app, these two markets along with Germany and Italy seem to pay the best eCPM (rate per 1000 impressions). Today we got a couple of emails letting us know that Mayhem Sofware has been accepted into Microsoft Bizspark program which provides support to startups. One thing we're going to find useful is 2 years / $60,000 worth of Windows Azure hosting. Having worked at two previous start-ups I know that companies need to carefully consider their product and hosting choices. Something we've been careful to avoid is what used to be called the slashdot effect. This is a situation whereby a strartup's web product gets a sudden boost in exposure and their hosting package cannot match demand. Therefore we've been avoiding making apps that rely heavily on third party hosting. When choosing a leaderboard solution for our new game Snowball Ninja I did a fair bit of research and was luckily to find mogade which offers a free and seemingly scalable online leader board solution. So with 2 years/$60,000 of Azure hosting expect to see some cloud based windows phone and windows 8 apps being developed by us in the near future. 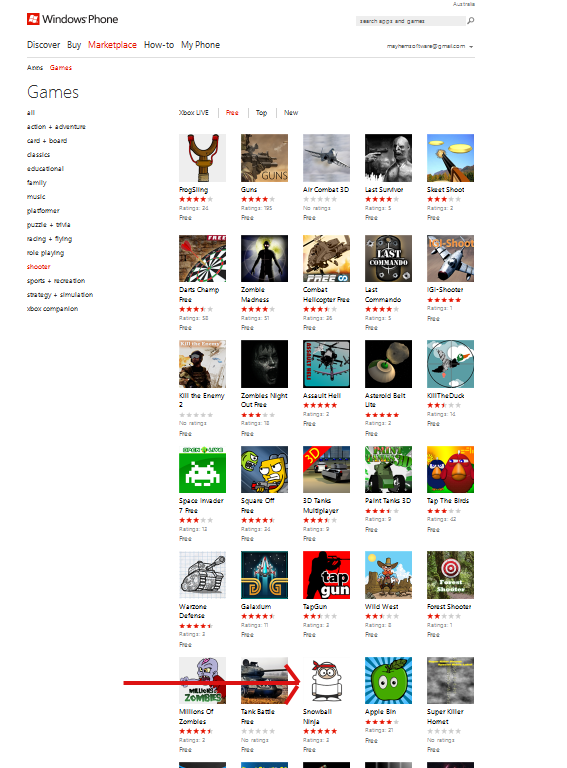 Version 1.1 of our new game Snowball Ninja was released 2 days ago and we're happy to see it steadily climbing rankings for free shooter games in the windows phone marketplace. Last week our new game snowball ninja hit the windows phone marketplace so since then most of our time has been spent on marketing activities promoting it. At this stage it seems our strategy has been fairly effective as the game is ranked between 20-60 in most major windows phone marketplace regions, for free shooter games. Getting the game into the top 50 lists has been our immediate goal (more-so than making short term revenue) as the most important ingredient in the ascendancy of some of our other successful apps has been making it into the top 50 for a particular marketplace category. Once an app reaches this level it has a very good chance of maintaining it's place as the level of visibility you get for a top 50 app is huge. Here's a few marketing tips we came up with for developers of windows phone games. It's based purely on our intuition and the experience we gained marketing snowball ninja over the last week. This goes without saying. If your game sux no amount of marketing is going to be worthwhile. Making it as "sticky" as possible should always be in the back of the game designers mind. A couple of weeks ago I was tossing up whether to include a leaderboard for Snowball Ninja or include it in an update at a later stage. I knew it was important but having spent quite along time developing the app the urge to get it out was hard to overcome. In the end I decided to include it which delayed the apps release by 3-5 days. I'm now convinced I did the right thing by including it as this has been a major ingredient in users coming back again and again. I can see this when I check the overall leaderboard and notice that many of the same users are returning each day and fighting it out for top spots. Chose a category for which new games are less frequently released? If your game could fit into multiple categories choosing a category for which new games are less frequently released can be an effective strategy. This is because when your game is released it will spend longer at the top of the "new" list in its category resulting in better visibility and more downloads. A while ago I saw a game with a strangely familiar title. I think it was something like "angry ninjas vs fruity birds". I assume the author was hoping their game would show up when users search for popular games such as fruit ninja or angry birds. To me this seemed a bit tacky but I understand the developers reasoning. In our experience Title seems to be weighted much higher in regards to marketplace search than the keywords entered when submitting a game to the marketplace. It has also recently been revealed in msdn forums that only the first 5 keywords entered are actually used in the marketplace. I actually wanted to call our game snowball bandit which I think sounds better and is probably more appropriate but ended up going with snowball ninja as ninja is such a popular search term. Beta testing has 2 great advantages. Firstly you will get a much higher quality game by acting on the feedback you get from your beta testers. In addition beta testers become great evangelists for your game. They show the game to their friends and are likely to tweet about it. I got some great feedback from my beta testers and all of them have been nice enough to tweet about my game which I'm sure has been an ingredient in its success. 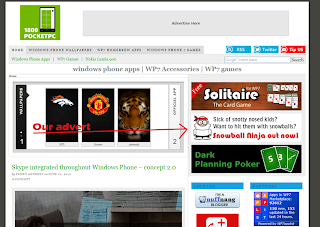 We paid for the following advertisement on 1800 Pocket PC which is an excellent site operated by George Saijo and dedicated almost exclusively to windows phone news. Apparently over the course of a month you can expect about 50K-100K impressions for the type of advert we purchased which came to $100. Getting bloggers to write about your apps is a great way to get attention that will result in more downloads. So far we have had two reviews / write ups which have helped increase our exposure. 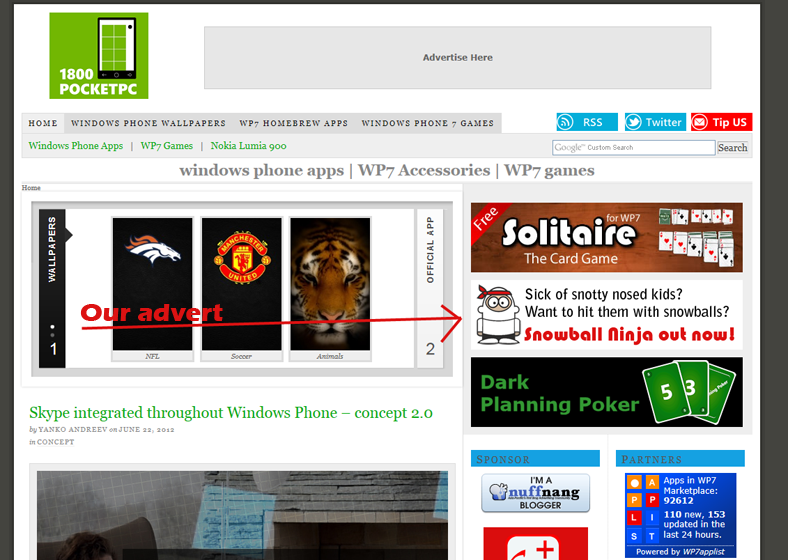 The first can be found here on bestwp7games.com and the second was on the dutch blog pocketinfo_nl. It can found here in dutch and here in english. 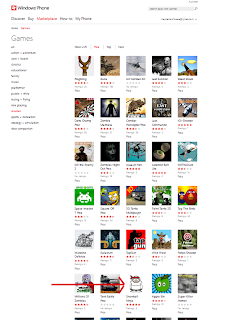 -You can submit your game to bestwp7games for a review or press release by visiting this page. -Another good option is wmpoweruser where developers can write an article about their game. This can be done here. 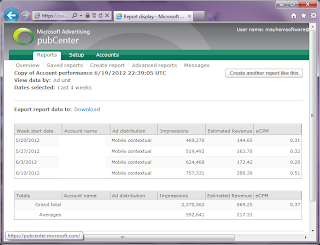 Ad duplex is a great way to increase awareness of your apps. Essentially you agree to serve ads for other apps in your application and in return ads for you own app are shown in other participating applications. After reading about how taptitude used ad duplex to help increase their exposure we decided to make this part of our strategy. So as soon as Snowball Ninja was submitted I set about updating the rest of our apps to support ad duplex. For some I implemented a web service which allows me to remotely control whether ad duplex is used exclusively or only when a pubcenter advert fails to load. This is another no brainer. Get out their and write about your game. Tweet about it. Post links on facebook. Write blog posts about it. The more you write about it the more exposure you will get and therefore the more downloads you will get. I was able to connect with all my beta testers as well as the two bloggers who did write-ups on Snowball Ninja through twitter. So this was definitely an essential part of our marketing strategy. Has a strategy like this worked for you? Do you have other ingredients in your marketing strategy. Please tell us about it by leaving comments or hitting us on twitter. Our new game Snowball Ninja has now been in the marketplace for justover two days and the results are looking pretty good. Our online leaderboard service Mogade showed 626 Game loads and 152 Unique users yesterday. These figures are up from 505 game loads and 133 unique users on day 1. 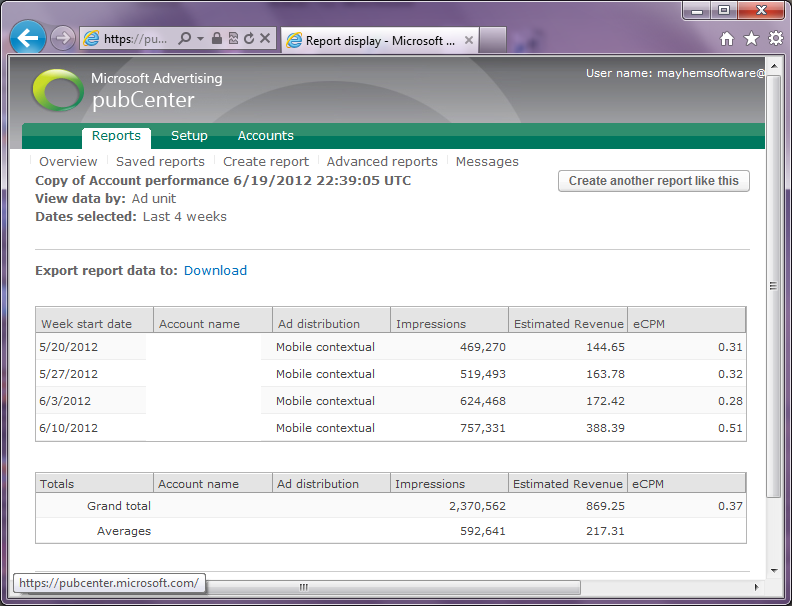 According to ad duplex we served 1290 exchange adverts yesteday which is a 25% increase from 1031 we served on day 1. According to pubcenter we served 964 paid adverts yesterday which was big increase from 170 we received on day 1. Check out Snowball Ninja by clicking here and let us know what you think by leaving us a review in the marketplace. Our new game Snowball Ninja was released yesterday and so far the response has been fairly positive. According to our online scoreboard solution Mogade the game had over 500 plays yesterday. The real number was probably a fair bit higher as this does not take into account certain situations where the game is played offline or when the user chooses not to submit their score to the leaderboard. AdDuplex showed 1046 adduplex ad impressions were served for Snowball Ninja yesterday. Once again the actual number was probably higher as this does not take into account offline plays. As the game was only available via deep link and was not showing up in the marketplace via searches or via the "new games" heading I am reasonably satisfied with these numbers. All of these plays would have occurred via links I posted on twitter, adverts on 1800 pocket pc and ad duplex ads. Today the game is now showing up under "new games" in the marketplace so hopefully that will help things a bit. Check out the game here and leave us a review. More tomorrow. Since my last, fairly despondent post about advertising revenue things have improved somewhat. 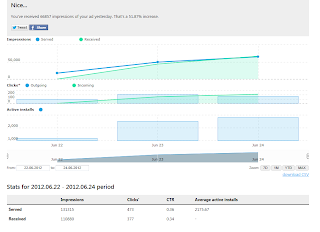 Our impressions having been steadily growing and even our eCPM is at a more acceptable level. 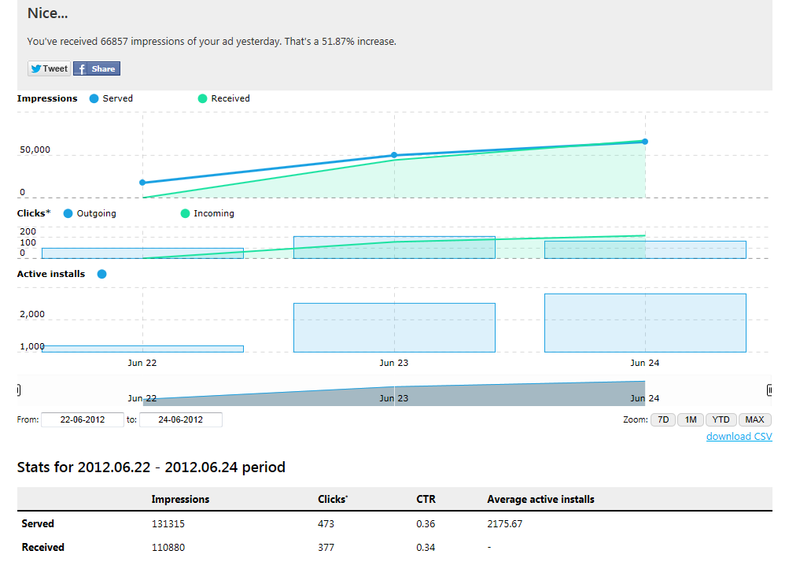 Currently we're getting about 120,000 ad impressions per day which works out to aprox 3.72 million per month. Not a bad figure. Fb viewer is still bringing in the large proportion of this revenue however we've seen upward movement in the earnings brought in by many of our apps particularly Camera Flashlight, Timezone Converter, Beat My Drum and Xkcd Viewer. Our new game Snowball Ninja was released yesterday and so we're hoping that will start to build on this improvement in our advertising income. Our new shoot em up game Snowball Ninja is currently undergoing beta testing and will be coming to Windows Phone very soon. Here's a sneak peak video of the game being played. Enjoy! April and May are really the first months we've made any money at Mayhem Software. It's not much but finally we are getting some monthly revenue which equates to more than a couple of cheap meals out. In April we made $762.10 and in May we made $691.56 (See screen shots below). Certainly not enough to live off but it's a start. What's interesting (and kind of annoying) is that the number of impressions we received doubled, and yet we still made less money. In fact our average eCPM more than halved in May. Anyway I guess the main thing to take away from this is that advertising earnings are very unpredictable. All we can do is keep pumping out the apps and hope this downward spiral in eCPM doesn't continue. Our new game Snowball Ninja is almost complete. It's basically a 2D "shoot em up" where you get to throw snowballs at kids. If you would like to be part of the beta testing group then send us an email or a Direct Message on twitter with your live id and we'll add you.